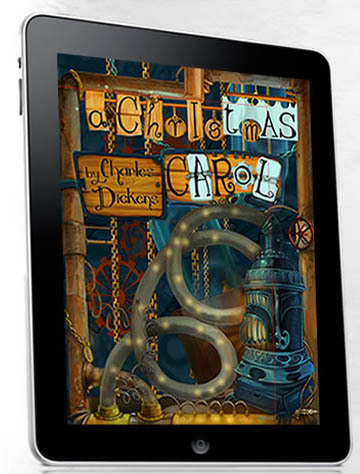 Charles Dickens’ most famous novel, A Christmas Carol, is coming your way as a steampunk-styled e-book app on iTunes. I even have a trailer for this strange little beast. Look upon it as an early Xmas present to you, my dear readers, from me, the ghost of authors’ present. Makes me wish I had a piece of hardware with an ‘i’ somewhere at the start of the brand name. Sadly, I don’t. Hint hint, if you’re stuck for what to get me for Christmas.